As a treat, I have a special bonus post. 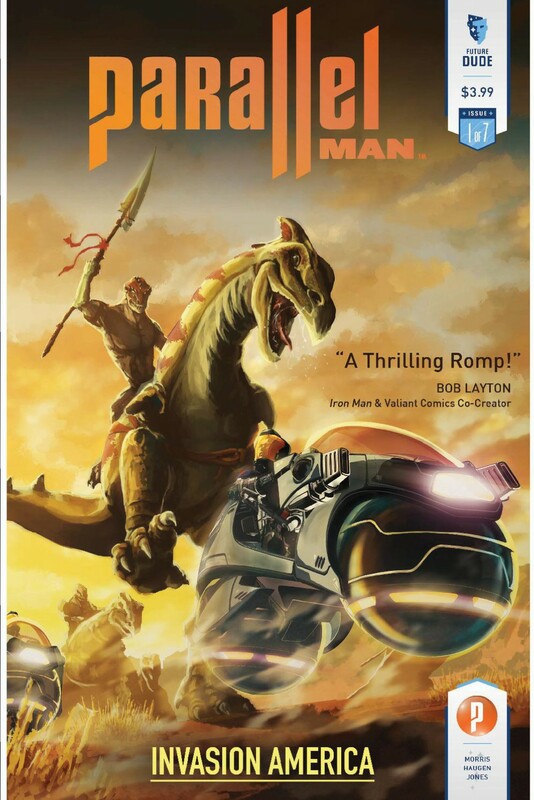 I recently got my hands on a pre-release copy of “Parallel Man.” It’s a new comic set to be released in a seven-part series by FutureDude Entertainment, with the first released on October 8th of this year and the last released next April. So, without further ado, I present to you “Parallel Man”! The comic book begins by setting the stage through a “the story so far” section. In it, it explains that that, in an alternate Earth, rather than developing atomic weaponry at the end of World War II, they develop technology to travel between different dimensions. This technology leads to the America of that world nearly destroying their home Earth, but also to their colonization of many other Earths. The story begins as they begin their conquest of our own. We’re introduced to Warren Cartwright, the leader of the conquering Earth, which calls its regime the Ascendency. His brief interactions with President Obama establish the story as taking place during the present time. Directly after this incident, we meet the protagonist of the series, a man called Agent Morgan. He’s been sent to gather information on our military for the fast-approaching invasion by the Ascendency. However, this agent seems to be doing something other than his officially designated mission. As he pulls a strange piece of metal, his computer-thingy companion states that the object is not in any of his databases. We get our first glimpse of the seemingly laser-based weapons of the Ascendency when a squad appears and begins attacking our hero. The ensuing chase gives us a chance to see several other Earths conquered by The Ascendency, including Chinamerica and one in which humanoid dinosaurs ride different other dinosaurs. It’s pretty fun. I think it’s the most fun I’ve had reading a comic book chase scene. I wondered briefly as to why some dinosaurs became kinda humany-looking, but then there was a T-rex with chicken arms. Nothing can be wrong with this. There’s also enough dialogue during this scene for it to come out that the leader of the squad chasing Morgan is a woman whose men refer to her as Major Cartwright. As you may remember from the last paragraph, Cartwright is also the surname of the leader of the Ascendency. Are they related? Probably. He is white, while she appears not to be, but they have the same blue eyes. Also, it’d be weird to give two unrelated characters the same last name. We also get some hints as to both backstory and to the greater plot, as it comes out that Morgan’s grandfather was some sort of scientific dissident in their home world and part of a group called the Futurists and have been a threat to the Ascendency. We also find that said grandfather is currently living in our Earth. The scene at Morgan the Elder’s place is slightly confusing. He seems to have a grandson named Nicholas. I’m not entirely sure where this kid came from. It comes out that the protagonist is also Nick Morgan. I’m confused about the chronology of the events. Or maybe I’m just unclear about the split between our world and the Ascendency’s. At any rate, Major Cartwright takes Grandpa Morgan into custody. The comic ends here. Overall, I thought this was a very good first issue. I’m quite intrigued by both the worlds being built within the story and by what seems to be an exciting plot. I’m excited to find out what happens with these characters and why Morgan wants to take down his own government. I really, really like the art style for this comic book. The lines are very clean, with only a few extra lines to mark out characters’ features. It also manages to be realistic-looking enough to be well-within the tradition of American comic books, yet not lose a certain almost cartoon-like look that I, as someone who grew up primarily on shounen manga, really enjoy. The coloring is also very good. This is where my utter ineptitude when it comes to art is going to show, but something about it really appeals to me. A lot of the panels play with different sorts of lighting effect, particularly in the background. The layout of the sound effects are also well-done. They’re incorporated into the thing making the noise, which for some reason struck me as the coolest thing ever. I have to say, I really enjoyed this first issue. The art got me hooked right away and the plot seems interesting. I’m really interested in finding out more about both what the Ascendency intends for the worlds it’s conquered and what, precisely, made both Morgans turn against them. If you’re interested in reading “Parallel Man,” it’s due to come out on October 8, 2014, as I mentioned before. I encourage you to pre-order it now at your favorite comic book store with Diamond Code Aug141505, since number of pre-orders are quite often the deciding factor on whether new comic books succeed or fail. If you want to know more about Parallel Man, you can also find more information about this comic on the publisher’s website here.